The all-important event 2019 ARCA Racing Series Schedule is publicized under the name of Menards, who is sponsoring series. There will be 20 ARCA races for the 2019 season, 18 race tracks are going to host the event. The event races will take place in 13 different states of USA, starting from 09 February 2019 at Daytona. Lucas Oil 200 Driven by General Tire will begin the event as it will be the 1st race. 2019 ARCA Racing Series presented by Menards is the 67th season of ARCA series, Sheldon Creed is the defending champion. ARCA 2019 season will be the 1st season under the ownership of NASCAR. ARCA had integrated into NASCAR K&N Pro Series in 2018 season. From 2019 season ARCA will have conjunction with other racing series like USAC Silver Crown Series, Indycar Series, Monster Energy NASCAR Cup Series, NASCAR XFINITY Series, NASCAR Gander Outdoors Truck Series, and ARCA/CRA Super Series. There are three manufacturers who have different teams which have a number of drivers in it. Toyota, Ford and Chevrolet are the backbones of this event because they are the main manufacturers. Chevrolet has 13 teams with around 19 drivers, most teams from a maker. Ford has 8 teams whereas Toyota has 7 teams. GMS Racing team making a comeback into ARCA 2019 with Sam Mayer as a driver. KBR Development racing team will borrow technical support from GMS team. Fox Sports 1, 2 and MAVTV is the official broadcasters of the ARCA 2019 series which will show the live race. These channels are region-wise so the people from other places in the world will have difficulty to watch it. 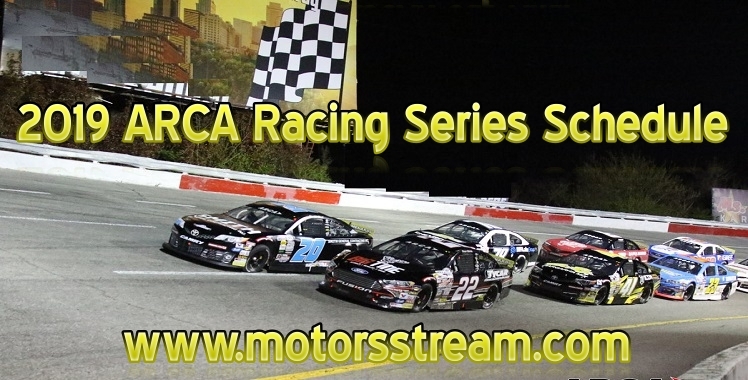 Don’t worry as our motorstream.com website will provide all races live streaming of 2019 ARCA Racing Series. Watch all races live in HD quality as per 2019 ARCA Racing Series Schedule on our site.